You will learn through problem-solving discussions that are representative of actual ethical decisions you encounter in your clinical practice. The blending of Susan’s experience as a lawyer, work within the court system and extensive clinical experience makes her a hands-on, knowledgeable instructor! Communicate how to avoid litigation dilemmas, licensing complaints and malpractice actions. Explore the legal and ethical considerations for the treatment of minor populations in North Dakota with regard to age of consent, confidentiality and custody concerns. Communicate how an understanding of common boundary and dual relationship issues/dilemmas can help you maintain appropriate relationships with your clients. Recognize ethical challenges you should consider when responding to subpoenas that request disclosure of client records. 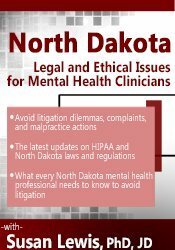 Analyze the limits of confidentiality as it relates to duty to warn law in North Dakota. Articulate how risk management strategies regarding technology can keep client information secure and avoid violating HIPAA. Susan J. Lewis, Ph.D., J.D., is a multi-credentialed mental health professional, with the unique combination as a licensed psychologist, forensic psychologist and attorney. She has over 25 years of experience in clinical practice with unique populations that have included female sexual offenders incarcerated at a woman’s prison, self-injurious individuals, forensic patients and individuals who suffer from severe and persistent mental illness. In addition to clinical practice, Dr. Lewis has served in leadership roles as clinical director, program manager, supervisor for psychiatry residents and post-doctoral psychology interns. Currently, Dr. Lewis teaches courses on Law and Ethics in Mental Health that are state specific to the laws of each state. She has also lectured nationwide on the DSM-5® and differential diagnosis. She taught courses at Harvard’s Extension School and Northeastern University on The Psychology of Criminal Behavior. She is the author of Legal and Ethical Issues for Mental Health Clinicians: Best Practices for Avoiding Litigation, Complaints and Malpractice (PESI, 2016) and From Deep Within: A Forensic and Clinical Psychologist's Journey (MacMillan, 2018). A sought-after consultant, Dr. Lewis works with attorneys on controversial issues such as dangerousness, competence to stand trial, criminal responsibility evaluations, and civil and criminal commitment. She works with attorneys on strategies of how mental illness might impinge on legal decision-making. Dr. Lewis has been adjudicated an expert in almost all of the district and superior courts in Massachusetts. Her extensive clinical experience makes her a hands-on, knowledgeable instructor. She is engaging and has a wonderful sense of humor, which she brings to her seminars. Financial: Susan Lewis is in private practice. She receives a speaking honorarium from PESI, Inc.
Nonfinancial: Susan Lewis is a member of the American Psychological Association. This self-study course includes 6.25 hours of state specific ethics instruction. Not all boards allow ethics credit for self-study products. If ethics is not specified within your licensing board’s approval statement below, please contact your board to determine the applicability and amount of ethics allowed. This self-study course has been approved by PESI, Inc., as a NAADAC Approved Education Provider, for 6.0 CE in the Legal, Ethical, and Professional Development skill group. NAADAC Provider #77553. PESI, Inc. is responsible for all aspects of their programming. Full attendance is required; no partial credit will be awarded for partial attendance.